Last month I decided I needed to satisfy my cravings to fly again so I planned and booked a very hectic 6 day trip from Melbourne including stops in Bangkok, Tokyo, Osaka and Hong Kong. This is my report of the flights I took on this trip. They include Qantas business class, Thai Airways first and business Class, Japan Airlines economy class, and EVA Air business class, including a Hello Kitty flight. The day started in the business class lounge with a great view of the domestic apron in the pre-dawn. I had a cup of coffee and a snack whilst admiring the views, including a couple of Boeing 767's which will be withdrawn from service by the end of December. There is a myriad of options available for check-in for domestic flights. For me I had checked in through the website and printed my boarding pass (as shown above). I dropped my bag off at the automatic baggage drop area with the 'Q Bag Tag' which scans automatically and knows my flight details through my frequent flyer number. Other options to check in include scanning your frequent flyer card on the Q reader poles located throughout the terminal, the selfe serve kiosks in the terminal, through the app on your phone or m by using the mobile website. At 5.40am flight QF400 was announced as being ready for boarding, so away I went to gate 11. On this particular morning it was a public holiday in Victoria so the flight was quite lightly booked. Since there was very few business folk travelling today Qantas was not operating its usual weekday schedule, with the next flight not due to depart until 7am. As I arrived at the gate I noticed that today's service was being operated by VH-EBV, which is in the 'oneworld' livery. This aircraft was quite new, having been delivered just under 2 years prior to the flight. Unfortunately this aircraft was equipped with the 2x3x2 recliner seat configuration in business class. Qantas recognised how unpopular this was a while back and stopped selling the middle seat, replacing it with a working area/tray table instead. Soon these seats will be a thing of the past thankfully, with the new A330 suites due to be installed over the coming year or so. On today's flight out 36 available seats only 11 were occupied, which meant lots of room to spread out. Upon entering the aircraft I was greeted with a very cheerful Qantas cabin crew team. I was immediately addressed by name and that happened throughout the flight. Just before 6am the doors were closed. We did seem to spend a few minutes waiting for some of the cargo to be loaded before eventually pushing back and taxi'ing down to runway 34. The daylight was just coming out as we took off towards the north at 6.20am. I decided to have a sneaky morning sparkling wine and was presented with the standard domestic business class piccolo of Grant Burge sparkling pinot noir chardonnay. It's not a bad wine actually and I often partake in it during breakfasts on Qantas! The bread basket came around soon afterwards and I had a piece of sourdough along with an apple and cinnamon muffin. The muffin was fresh and delicious. All in all, the meal was very tasty and more than sufficient on a 60 minute morning commute to Sydney. Tea and coffee were also available and after I finished my champagne I enjoyed the rest of the flight with a nice cup of coffee. As you can see above, the leg room on these A330's is not particularly good, I believe it is quoted at 37 inches. Certainly it's fine for the commutes on the east coast, but to and from Perth it's always been rather disappointing, especially compared to what Virgin Australia offer on their A330. It's a very good thing that these aircraft are all being refurbished with suites soon. Then we will have a consistent A330 experience regardless of whether being used on short haul, trans-con or international flight. The inflight service on this sector was second to none. I was always checked on to ensure I had enough to eat and drink, and the crew seemed genuinely happy. They were keen to chat about my upcoming travels and were incredibly polite and friendly at all times. 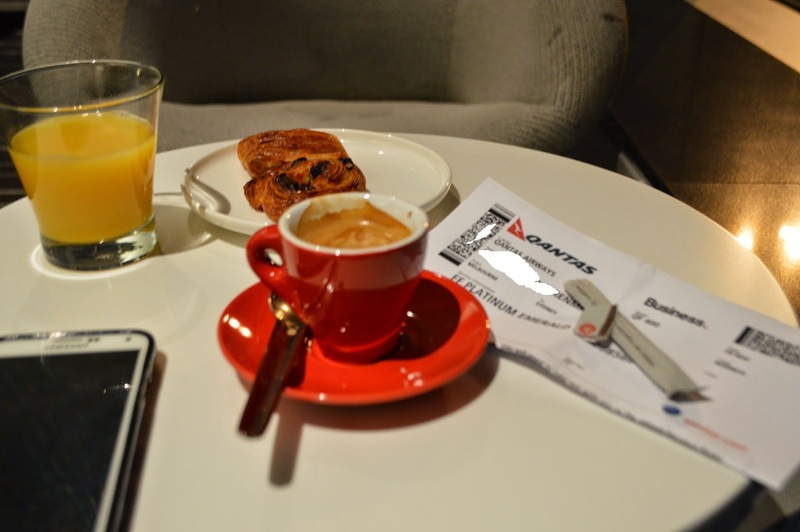 This kind of service reminded me of just why I choose Qantas whenever I can on domestic flights. Admittedly the crew had a light workload with so few passengers but I have to say this short flight was made memorable by these crew, so thankyou if you happen to be reading this. You are a credit to Qantas! The descent and landing were fairly routine, we did have a slight deviation of our route to meet with air traffic control restrictions, because of that we arrived at the gate 7 minutes behind schedule, but I still had plenty of time to make my next flight. The next part of this series is Thai Airways First Class between Sydney and Bangkok, to be published in the coming days. Nice little trip report. Looking forward to the rest.